Ambien and melatonin have several differences but one distinct similarity -- they are both sleep aids. 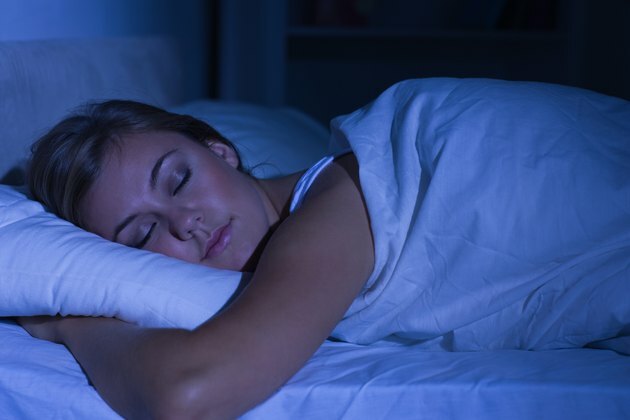 If you are taking Ambien and still have trouble obtaining a restful night of sleep, adding melatonin to your regimen may give your sleep cycle a boost. Learning about Ambien and melatonin can prepare you for talking with your doctor about your sleep aid options. Remember to always consult your physician before taking any medication. Ambien is the trade name for zolpidem, a prescription sedative-hypnotic medication. Ambien is usually prescribed to be administered daily at bedtime on an empty stomach. Taking Ambien within an hour of eating can dramatically increase the time it takes to make you drowsy. Typically, Ambien is prescribed for periods of time lasting no longer than two weeks. This is because your body quickly builds a tolerance for Ambien and the medication becomes less effective after approximately two weeks of consecutive use. Melatonin is a hormone naturally secreted in your brain and is responsible for regulating your body's circadian rhythm. If you suffer from insomnia due to a low level of melatonin, jet lag or shift-work sleep disorder, your doctor may suggest you take a daily melatonin supplement approximately one hour before going to sleep to assist you in getting to sleep faster. These supplements are available over the counter. Ambien and melatonin are generally regarded as safe to use together, although you should be aware that taking them together can cause increased sedation and dramatically impair your coordination. Because they have a synergistic effect with one another, it is imperative that you consult your physician before adding melatonin or Ambien to your nighttime routine. According to "Focus on Nursing Pharmacology," your dosage of Ambien may need to be reduced when supplementing with melatonin. The combination of Ambien and melatonin may be a suitable remedy to your insomnia. Talk to your doctor if you find that your memory and attentiveness are greatly impaired in the evenings after taking Ambien and melatonin, which may warrant a change in dosage, administration time or medication. These side effects tend to be most prevalent when taking Ambien and melatonin within one hour of each other.